Rector of BINUS UNIVERSITY Prof. Dr. Ir. Harjanto Prabowo, MM invited fellow BINUSIAN consisting of faculty members, employees and student representatives to attend the event which marked the start 2012, Wednesday (1/2). Also present was the CEO of BINA NUSANTARA Ir. Bernard Gunawan, Francis Santoso, MM, M.Sc, George Wijaya Hadipoespito, M.Sc., MBA, Lawrence Wibisono, BBA, M.Sc, Michael Wijaya Hadipoespito B.Sc., MBA, Stephen Wahyudi Santoso, BSE, MSIST. In the occasion, the rector expressed several key points, including achievements and memorable events of BINUS UNIVERSITY which took place in 2011. 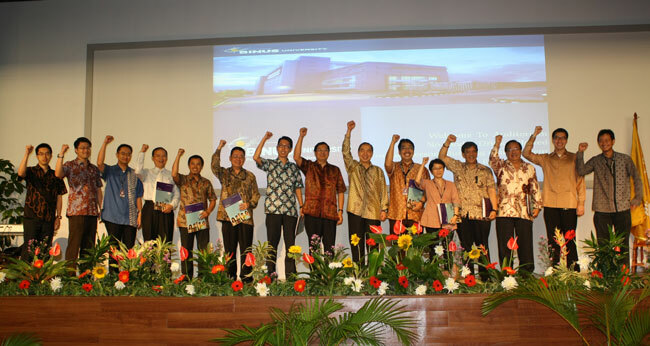 BINUS UNIVERSITY’s victory in Indonesia Make Award 2011, Tempo’s survey which points out BINUS UNIVERSITY as the first national university in conducting information technology education, Two Stars from Quacquarelli Symonds and the title of Best Communication 2011 (Management #6 and Communication #5) from Swa Magazine are some of those achievements. The rector also stressed the importance of Global Employability & Entrepreneurial Skills in curriculum. “Alumni of BINUS UNIVERSITY are demanded to have global standard technical competencies and global employability & entrepreneurial skills (E&E skills) which consist of 6 key soft skills, English/Chinese/Japanese competency, numerical literacy, ICT skills and International experience,” the Rector explained.